With added video content for the full Psychic News experience. Modern ‘miracles’ with absent healing: The ground-breaking work of Carol Everett. Reveal your true nature: Introducing Billy Roberts’ psychic handwriting analysis. Sixth sense and sensibility - Kay Hunter on that mysterious ‘knowing’. 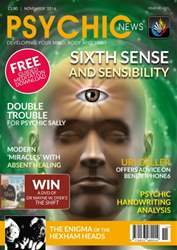 Spirit communicator identifies herself with a song: Nic Whitham reports on an unusually evidential communication. The Imperator mystery: Leslie Price investigates the true identity of a famous spirit control. In my opinion. . .Journalist Sarah Prendergast on animals and a moral dilemma. Your spiritual art: We feature some of your wonderfully spiritual works of art. Bright stars, coded letters and a cheating boyfriend. The enigma of the Hexham heads: An eerie tale of unearthed carvings. Physical Mediumship: The controversial work of the Felix Experimental Group. Do we decide, or do they? David Hopkins on the dangers of giving away our power. Spiritual events and psychic fayres for November.